The seven companies that make up PRABIA are working full-time, while also contributing to the island’s recovery efforts. A little more than a month after the passing of Hurricane María through Puerto Rico, the companies that make up the Puerto Rico Agricultural Biotechnology Industry Association (PRABIA) are operating at full capacity, executives said. The industry also remains firm in its commitment to disaster relief efforts, making donations and delivering aid to the communities most impacted by the hurricane. The activities undertaken by the agricultural biotechnology industry in Puerto Rico, mainly research and development, are of great importance to Puerto Rico. PRABIA accounts for an annual economic activity of $125 million in the region and employs more than 5,000 people. Beatriz Carrión, executive director of PRABIA, noted that no employees have lost their jobs or been furloughed because of the natural disaster. “We are pleased to notify that the industry — our companies and employees — are up and running, working for Puerto Rico,” said Carrión. “Each PRABIA member company has taken the necessary steps to begin operations. Our commitment to Puerto Rico is strengthened and returning to work is an important step in the recovery and normalization process,” she said. The executive added that PRABIA member companies — AgReliant Genetics, Bayer CropScience, Dow AgroSciences, DuPont Pioneer, Illinois Crop Improvement Association, Monsanto and Syngenta — have already begun planting seeds, given that Puerto Rico is currently in the midst of the growing season. Member companies also continue to aggressively contribute to disaster recovery efforts on the island, she confirmed. To date, PRABIA member companies have pledged more than $2 million in donations and delivered hundreds of thousands of pounds of aid to the areas most affected by the hurricane. “PRABIA is here to serve farmers, beekeepers, scientists and Puerto Rico in general. We are proud to be responsible corporate citizens,” said Carrión. “As such, we feel we have the obligation and a responsibility to help in any way we can because the communities in which we operate are also our home. This is an ongoing effort and there is still a lot to be done,” she added. 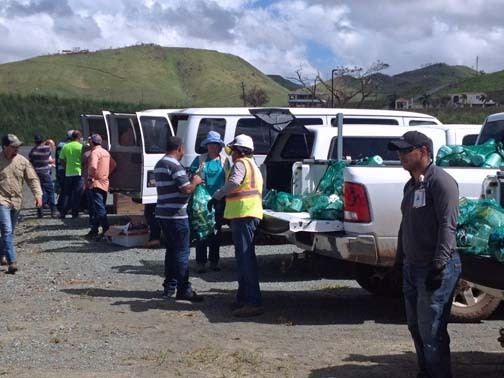 To that end, the employees of PRABIA member companies are actively participating in relief efforts, and “are currently in the community working hand-in-hand with relief workers and helping out,” Carrión stated. The aid provided by PRABIA member companies are giving includes cash donations to non-government organizations like the Puerto Rico Food Bank, the American Red Cross, Habitat for Humanity, and the Centros Sor Isolina Ferré, a social services agency that helps economically disadvantaged communities. The agricultural biotechnology companies have also sent to the Island several aid flights with basic supplies such as food, water and medicine. Several of these were distributed in collaboration with the mayors of the southern region, after identifying communities in need. PRABIA member companies operate mainly in the southern region of Puerto Rico, including the municipalities of Salinas, Santa Isabel, Juana Diaz, Ponce, Guayama, Lajas and Guánica. Hey Buddy!, I found this information for you: "PR agricultural biotech industry fully ‘up and running’". Here is the website link: https://newsismybusiness.com/agricultural-industry-running/. Thank you.